Consumers (ages 18+) are spending an increasing amount of their time online — in fact, a recent study showed that the average British adult spends more time online than they do sleeping. And over on this side of the pond, things aren’t much different. But how are consumers spending that time? Which devices are attracting the greatest share of time spent, and what are people doing while they’re online? 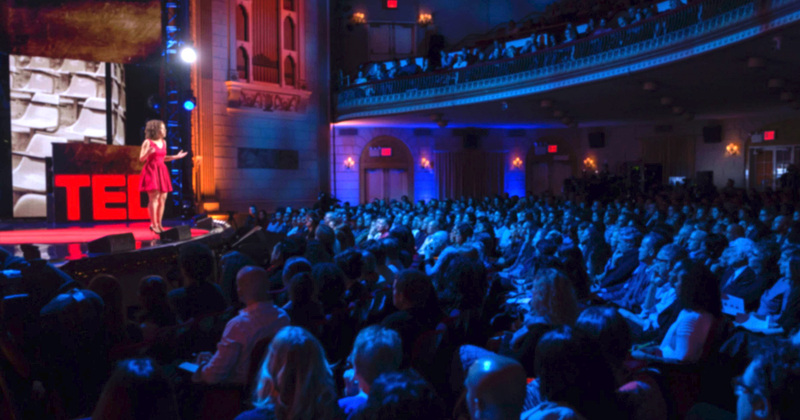 Knowing how consumers behave is critical to capturing their attention. 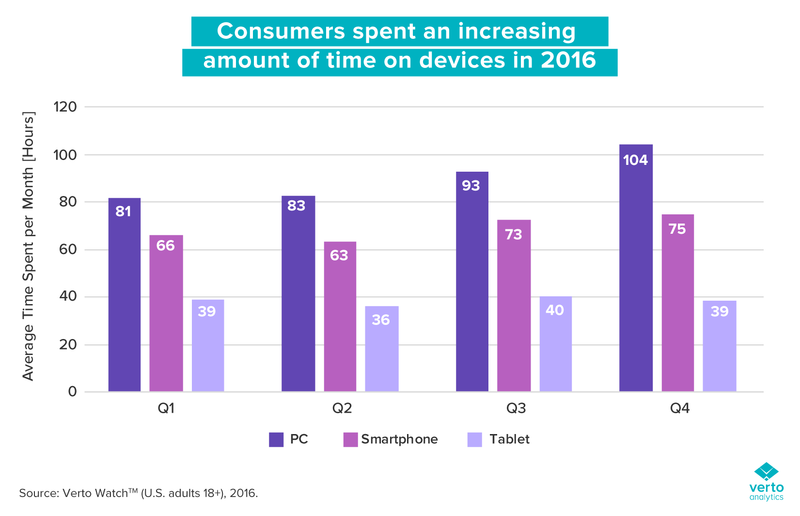 Verto Analytics data shows that the average American adult owns five devices, and they’re spending an increasing amount of time engaged with these devices — especially mobile ones. By the end of 2016, the average American adult spent 114 hours per month on mobile devices (smartphones and tablets) and 104 hours per month on PCs — nearly four hours a day spent on mobile devices alone. For mobile marketers, that’s an impressive chunk of consumer time and attention. To reach exactly the right audience, marketers need to understand the context of those consumers’ usage. Verto’s latest research shows that over the course of 2016, the amount of time that consumers spent on smartphones rose nearly 14 percent. And much of that increased time spent was on apps. 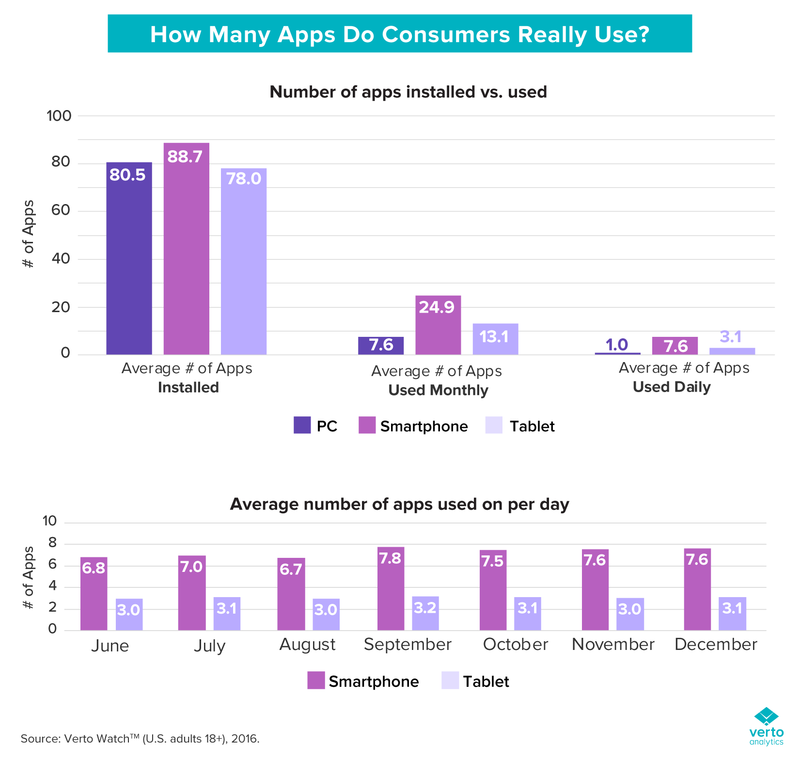 While the average consumer has 89 apps installed on their phone, they use approximately 25 apps weekly and just over seven apps daily. These statistics leave many marketers wondering whether they are one of those core seven apps, and just which apps those are. With the rise of mobile usage comes another important consumer behavior to watch: multitasking between apps in a single session and across different devices is becoming the new standard for consumers. 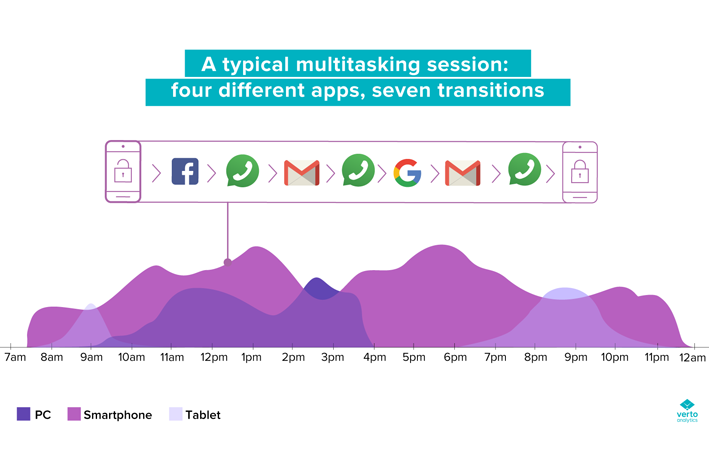 Verto Analytics defines a multitasking session as one session during which at least four different apps are used and at least seven different “shifts” (from app to app) occur among these apps. Our data shows that consumers are not only spending more time online engaged with apps overall, but also using multiple apps during a single session. For example, a typical session might include launching the Facebook app, clicking a link that leads to a web site, going to the Google Search bar from there, clicking on an ad, and ending up in the ESPN app. Then the user might quickly check emails and WhatsApp messages before returning to Facebook. 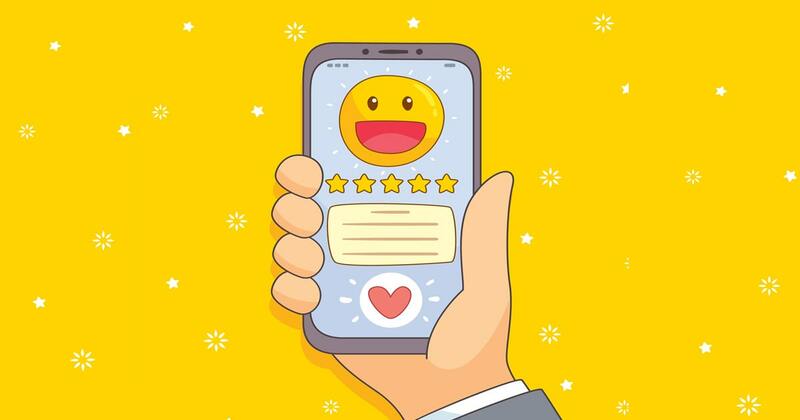 This is a complicated pathway for brands and companies to follow, because the consumer’s behavior involves a number of apps — and even more brands. Verto Analytics data shows that almost a third of all online device sessions (e.g. when a consumer uses any internet-connected device) fall under our multitasking criteria, and this number will continue to grow. 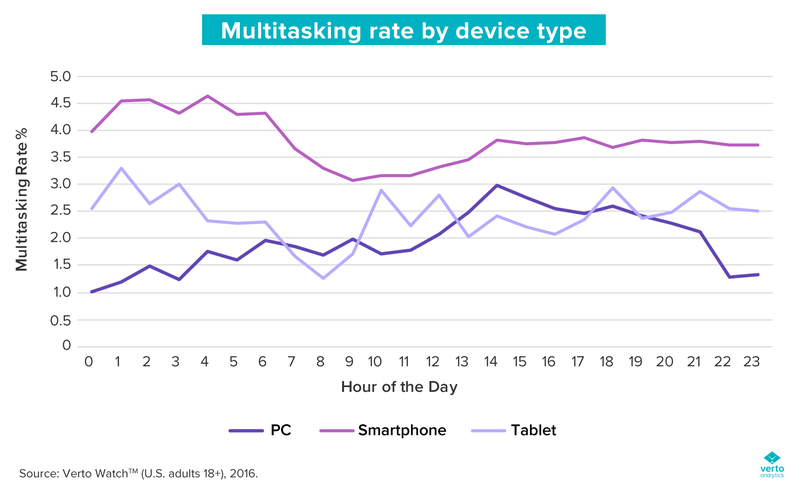 And multitasking on smartphones occurs twice as often as on PCs and tablets, which means that multitasking is an increasingly prevalent and important consumer behavior for mobile marketers to watch. 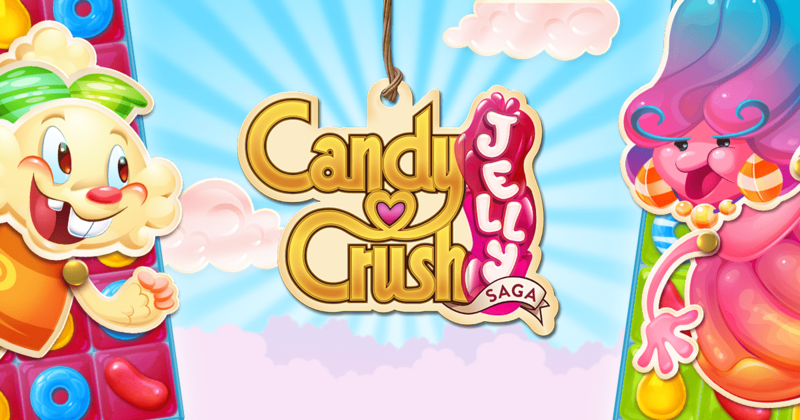 But mobile isn’t the only game in town: marketers must keep the cross-device consumer in mind. Despite the clear shift towards a mobile-first approach for many industries, our data shows that the cross-device consumer is a vital marketing touchpoint for sectors such as e-commerce. The latest Verto research shows a clear preference for cross-device activity among online shoppers: 113 million users per month access shopping websites on their PCs, 123 million users per month access shopping apps on smartphones, and 26 million users per month use shopping apps on tablets. Consumers are spending more time on smartphones, and most of that time is on a very specific number of apps. Study the stickiest apps (the ones that customers use most on a daily and weekly basis) and adopt some of their features. Because of the rise in multitasking, the amount of time that consumers spend online in total hours could exceed actual waking hours — a change in audience attention metrics that is key for marketers to know when planning campaigns or fighting for an individual’s attention. While consumer engagement is already an important metric for most brands and publishers, the micro levels of engagement — the tiny interactions that occur within the dozens of online sessions consumers have during a typical day — indicate timing and context. Understanding this complexity is useful for product development, media mix modeling, ad targeting, and overall market understanding. For example, are Gmail users driving up the rate of so-called “dark social” because of their propensity to click links directly within the body of emails instead of sharing links through social media platforms? Interested in more consumer insights? Follow Verto Analytics on Twitter and LinkedIn or download our latest report, Multitasking and Mobile Apps: New Ways to Measure Consumer Behavior.